Double-click the printer you are using to view the queue. One thing you need to understand about the print spooler service – though it does provide simplified task management, it also consumes memory space. This can cause issues depending on the volume of tasks being held in the queue and the amount of memory the printer contains. If 10 different jobs are sent to a laser toner printer at the same time, the spooler intercepts the orders and sends only one at a time, in the proper order. This takes a chunk of memory, but ensures that the printer will never be overloaded. The print spooler is an organizational tool that allows users to send documents and close out of an application before the data even hits the printer. It will deliver documents in succession and chronological order, unless otherwise specified. 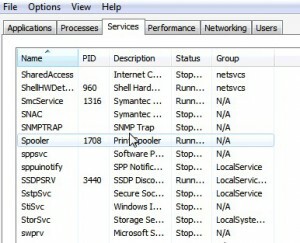 Except in the case of spooler errors, most users will never need to access the spooler directly, as it handles its tasks silently in the background.